The Joie Litetrax 4 Flex Pushchair is a slim and sporty pushchair with excellent suspension; swivelling but lockable front wheels and a great smooth recline seat. Featuring the Liverpool Football Club logo on the inside of the chair seat and the distinguished red colour of LFC's 125th anniversary home kit for the 2018/19 season, this pushchair is nippy, bold and an excellent performer. Who is the Joie Litetrax 4 Flex Pushchair suitable for? 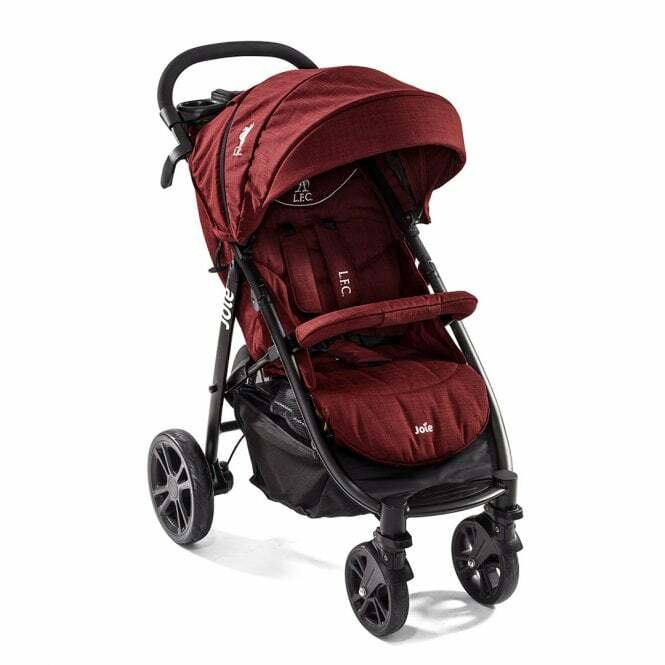 The Joie Litetrax 4 Flex Pushchair pays homage to the red of Liverpool Football Club's home kit and features the club's logo on the inside of the seat. It is suitable if you have a newborn baby and need a lightweight chassis to manoeuvre as well as a cosy bumper bar for your little one until they are around 3 years old. Also, as this forms part of a Travel System, the Joie Litetrax 4 Flex Pushchair is great for pairing with the Joie Group 0+ Gemm Infant Car Seat and the Joie Group 0+ i-Gemm Infant Car Seat to make your journey easier from start to finish. No adaptors are needed for the Travel System. Why should I buy the Joie Litetrax 4 Flex Pushchair? If you're looking for a chic yet athletic looking, lightweight pushchair design then the Joie Litetrax 4 Flex Pushchair is the one for you. The ingenious mid-seat fold means that you just reach into the seat with one hand, pull up the seat fold and instantly the pushchair tucks and locks into a compact size with no hassle whatsoever. This compact package with easy to carry handle, then fits into the boot of the car or the luggage area of the train in a jiffy. As you would expect from Joie, the Litetrax 4 Flex Pushchair has a secure 5 point harness for baby's safety and a fabulously comfortable set of smooth recline positions; there'll be no need to squirm or complain for sleepyheads with this pushchair by your side! The leg rest can be moved to suit your baby's height to once again, ensure maximum comfort and cosiness. Each of the 4 wheels has in-built suspension for a smooth ride and the front two wheels swivel to help steering. The brakes are designed not to scrape or scuff shoes and are easy to step on and off again. Made from hard-wearing but stylish fabrics, the Joie Litetrax 4 Flex Pushchair has a UPF 50+ sun hood that is both expandable and that easy folds away when not needed. With a ventilated mesh insert, easily unzipped from the side, the hood becomes even more protective but without losing the air flow to your little passenger. For your benefit, the Joie Litetrax 4 Flex Pushchair has a parent tray for you to keep your travel essentials on and hold cups. The basket is spacious and convenient - holding up to 4.5 kg of groceries. What are the specifications of the Joie Litetrax 4 Flex Pushchair? Is the Joie Litetrax 4 Flex Pushchair compatible with any Car Seats? Yes. the Joie Litetrax 4 Flex Pushchair is compatible with the Joie i-Gemm 0+ and the Joie Gemm 0+ Infant Car Seats. Do I get a warranty with my Joie Litetrax 4 Flex Pushchair? Your Review - This is my 4th pushchair (I know right) and it surpasses the others by miles. It's easy to push, extremely comfortable, very easy to collapse and it looks amazing. The sun hood comes down much further than the others so my little one is completely shaded from the sun, bug thumbs up for that. I wish I'd purchased this first! !